Writers are strange. Their imagined worlds are often so compelling that the “real” world has trouble keeping up. Writer brains are different, they will imagine a character they love and then imagine all the ways they can make that characters life a living hell (often with a triumphant ending, of course). They think about story constantly. What works and what doesn’t. What satisfies and what disappoints. How we learn from story and how we are moved by them. They’re different, strange beasts. They’re artist. And as I’ve been doing this for a while, I’ve met some of these folks and gotten to know them. In 2012 and against this year I went to the Superstars Writing Seminar where a few hundred of us gather, learn, talk, and play. But more importantly for me, I get to feel at home. I’m surrounded by people with the same affliction as I have. They know the how hard it can be to keep writing some days, how bad yet another rejection can be, or the sheer joy of selling a story or delighting a reader. They too love story enough to give up all they can for it. They too feel compiled to tell stories. It’s home. The Superstars gang call it “tribe,” which has the right ring to it. We share something common (the story telling affliction) and we help each other out. This year, for the second year in a row, the tribe has come together and created a collection of short stories. All proceeds from that collection go back to help the tribe in the form of the Don Hodges Memorial Scholarship Fund (Don, one of our tribe members, passed away this year and the scholarship fund was renamed in his honor). The fund is used to pay the tuition of writers that can’t afford it. The whole thing is the tribe helping the tribe (if you’re a writer, go find out about the scholarship right now). 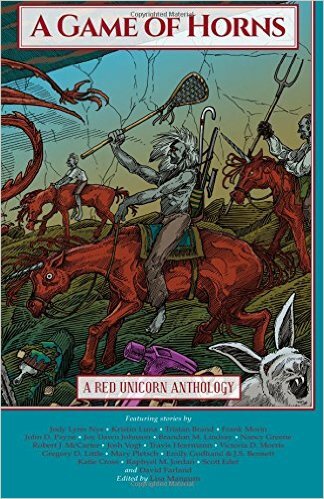 For the second year in a row, one of my stories was selected to be included–and having read the first collection, One Horn to Rule Them All: A Purple Unicorn Anthology, I am honored. My tribe knows how to write. These are good stories. Perhaps I should back up a bit and explain the unicorn thing. Kevin J. Anderson and Rebecca Moesta lead our tribe and put on the Superstars Writing Seminar. In one of the talks Kevin gives he says something along the lines of, “If an editor asks you for a story about a purple unicorn, you write a damn good purple unicorn story.” It’s about being a professional. Well, in 2014, someone stood up and said that they’d like to read those stories, and someone else offered to edit it, and the tribe went to work and made it. And this tribe thing is for real. One brief example. Last February at the end of the seminar, Kevin stood up (keep in mind this is a best selling author that teaches not for the money but for the love of his art) and named each one of us in the audience by name. I don’t think this was planned, he just stood up and did it. Close to two hundred of us. From memory. Showing what this tribe thing was all about. It was a hell of a moment. Kevin is a shining example of something I’ve experienced so much on this journey: writers reaching out to help other writers. So back to this year’s anthology. It’s called A Game of Horns: A Purple Unicorn Anthology. The stories had to follow two rules: 1) There had to be a red unicorn and 2) the story has to revolve around a conflict. I have a story in it called “Laura’s Magic Clock.” Neither the conflict or the unicorn are what comes first to mind. The conflict is internal–a man dealing with a devastating loss that he feels responsible for. The unicorn? Well it’s a clock–maybe a magic one. So, go see what my tribe created. Go help some writers learn this strange business we are in. Go enjoy some great stories. Go see the art my friends and I made.